With vibrant, active, and entertaining visual presentation, as well as a story and characters bursting with character, charm, and comedy, This is one of the best shows of the season that - according to the 6 other reviews at this point - nobody is watching at all. If you like older role-playing games like Final Fantasy, or basically any game with a fantasy setting (or just video games in general), this anime is a genuinely fun watch. Nobody is watching it, though. I really like the little visual details that they add in, like the text boxes or frequent pixel art showcase, that remind you that this is totally a whimsical game world. There are so many colors and happy expressions too; it pops out and sets itself apart from a lot of other anime. Too bad so many more anime are getting way more attention than this one. I get a Studio Trigger-esque vibe from the animation; everything is always moving, and it's just really fun to watch the characters do whatever it is that they're doing in the background. This makes the anime new and fresh if you choose to rewatch it. Too bad nobody is watching it in the first place. To conclude, watch this anime. Please. I have nobody to talk to about it with and it's killing me. There's so much to look at and analyze and talk about here, and I can't do any of that because I have to recommend this anime to everyone I know, and since they've never heard of it, it naturally goes to the back of their priorities. But it's so good tho. It's so good. OK, I cannot tell you how much I enjoyed watching this! I'm still laughing. This is fun. This is funny. This is reminiscent of when video games first showed up in the house, with all the backstories and clueless characters. The artwork is simple and warm, perfectly complimenting the story itself, which is a quest worthy of Mario after a night of drinking and playing darts with Luigi. Magic and mayhem get visited upon the world through the dagger and staff of our highly inexperienced hero and mage team. . .and what wonders they wreak! After deciding to give this show a watch after hearing it mentioned once or twice I decided to give it a watch and I was hooked. This is a show where the phrase "Blink and you'll miss it" can be taken quite literally. Guru Guru's plot and jokes move at a rapid pace and it's all at high quality. This is also a show that doesn't take itself to seriously with the possible exception of the absolutely ADORABLE relationship between the two main characters Nike and Kukuri. 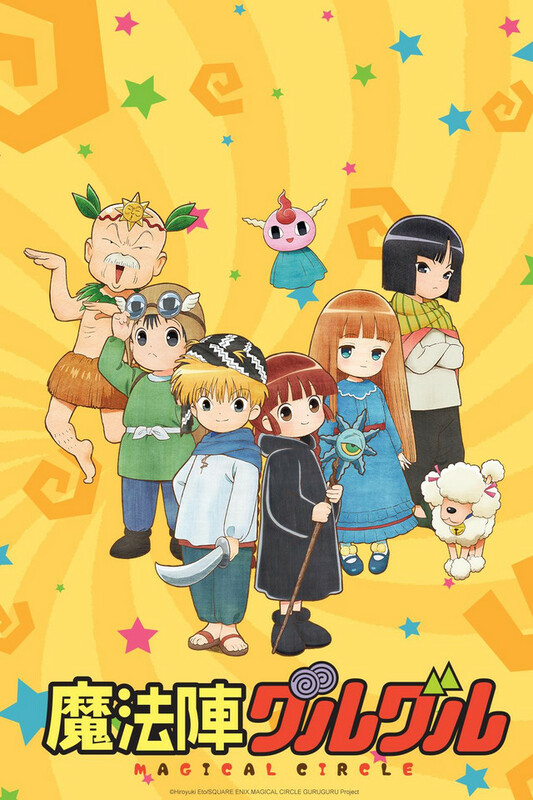 Overall, Mahoujin Guru Guru is charming, adorable, fast-paced, funny and childish in all the right ways and I can only give it my highest recommendations. It looks silly and childish, but don't let the art fool you, this story is one with a lot of heart and a lot of laughs. MCGG is an RPG nostalgia humor adventure trip. It's an engaging story of two heroes who set off to take down the demon king. What sets it apart though is its humor and satire of the RPG genre. The characters are seriously hilarious. The world is whimsical and just pops. And the call backs and references to old RPG tropes and images makes you remember playing games like Final Fantasy or Earthbound. There were moments that I genuinely burst into laughter and not just a giggle, but serious-all-out-please-stop-I-can't-breath guffawing. It's just a fun show with some seriously good writing and a fun plot. Give it a chance and watch it. There's a good chance you won't regret it! I don't normally write reviews but this anime is way to underrated so I felt compelled to help increase the popularity. I actually avoided this show the entire summer season because i thought the art looked weird and childish and HOW WRONG I WAS... There's nuances and jokes here inappropriate to appear in so many other anime, and on that note every episode is like a treasure box of easter eggs and references. Come Join Nike and Kukuri-chan's Super Fun RPG Adventure! My review is probably a bit biased because I absolutely loved this series since I was a kid. Owned the whole set manga and have seen both of the previous anime series. I was pretty excited when I heard Production IG picked this up to remake based on the whole manga. Neither of the two previous anime actually went through the whole manga since the manga took ages to finish. This version by Production IG is definitely my favourite so far. Now, onto the anime itself. I would say so far it stayed pretty faithful to the manga, and the random parts they have dropped did not hinder the flow of the story. Granted I was a little disappointed that not everything was animated (like how I was expecting to see something but it didn't happen) but given how they had to fit all 16 volumes in it is to be expected. Personally I felt it is quite rushed (evident by the story being told with the ending songs for a few episodes already) however since they only have 24 episodes to work with, it can't be help. I loved the colourful and bright visuals and the style mostly stayed faithful to the manga. Aside from it feeling rushed at times, the pacing is great with no fillers wasting any time. Even though I already knew what will happen in the story, the silly gag bits still got me laughing pretty hard. I have always loved the little random giddily extra bits the manga had, and the anime had stayed true to the random nature of the manga and seeing them animated in such a fun way brings a smile to my face. There is always a something random going on in the background you won't ever get bored. As a side note, this is probably the only magical girl (?!) series nowadays that doesn't have any fanservice and to me that's an excellent plus. Music is fitting and original. The OP is fun and catchy to watch, and the OST and sound effects in the series all worked really well. There is almost never a quiet or dull moment with this series, you could turn your head away for a few seconds and completely miss out on something fun. I loved how the characters would always go "skip the serious and boring part and get to the point!" and that's exactly what makes this story so much fun. Simple and beautiful animation with it being hilarious throughout the whole anime. One of the anime I saw as a kid but never watched as much because it looked dry and not all that satisfying to me back then. Well, I can tell you they out did there selfs. Just 2 episodes I'm hooked on the anime and the opening especially. Number 1 anime for the summer season for me. Just Perfectly Packaged From Beginning To End! A laugh fest through out, while keeping its charm it amused us endlessly and made us engrossed in their colourful world filled with old school comedy and adventure. Well animated, this series is a well packaged spectacle with a lovable cast of characters that you learn to not only love but see grow. The world building is also phenomenal as the series constantly updates us on the situation happening in previously visited areas. The whole world feels alive. A TV show that is perfect for people that grew up playing old school RPGs, a parody at its finest and a good adaptation of its old original series. Guru guru is one of the best. Mahojin Guru Guru is not a new story, but is is one of the best manga stories out there. It's a loving parody of the 8 and 16-bit era JRPG genre. The story is cute, silly, funny, very slapstick, yet surprisingly deep. The animation in this version snaps like like well choreographed dance. The zoom shots aren't vectored, just to give you an 8-bit feel from time to time. There is so much going on in every scene that you can watch it just for the artwork and animation, or spend time enjoying the story. The voice acting is top-notch. You can really tell this was a labor of love. It shows, and is worth multiple-playthroughs. Kudos, Studio IG. You did good on this one. Thank you CR for bringing it over and getting it subbed.